Look Out: Ranger Robin is Back! After an unaccountable absence of several years (! ), the incomparable Ranger Robin, the no-holds-barred rogue Park Ranger Action Figure, defrocked (hmm, perhaps that’s the wrong word in this context? ), excommunicated, and turned out to pasture by the fools in power, is back! Probably on account of good behavior…. And damn, is she anxious. What, she wonders, will “community” input mean for the Rose Garden in Prospect Park? This long-abandoned section of the park, best known to birders and the down-low, hasn’t seen any roses since… well, way, way back. And the three oval pools have been dry since Mayor John Lindsey’s day. “That was way before my time, bloggy boy,” says R.R. Anyway, the area is scheduled to be… improved. Uh-oh. 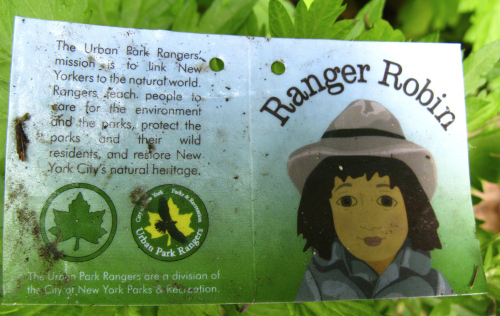 Ranger Robin shares my trepidation about all this, considering that, whatever the “input” is, the money will talk. As it did in the Vale of Cashmere, where a local plutocrat dictated the placement of yet another playground, and the Prospect Park Alliance literally stomped all over the po’ people’s pennies, raised to plant bird-friendly habitat, as they knelt to service his bankroll.